I like to group quilts together with similar characteristics to write about. But sometimes we get a couple of quilts that sort of break the mold. Here are some beautiful unique quilts that were just too hard to group with others. What do you think of them? Having just said these quilts were unique, here we have a simple square layer cake quilt. But don’t you love the way Carol used the zigzags. The colors are placed randomly, but the zig zag is alternated. To finish it she did a free motion meander all over it. This was her very first time doing free motion, and I think it looks great! Valerie completed this simple big blocked parallelogram quilt. The peaches and grays on a white background are quite striking. She quilted this with continuous arcs around each block. Simple but pretty, Valerie is a talented lady. She also made this Irish Chain quilt with similar colors as the previous quilt. I like the variety of prints with the white background. The double border is nice, too. 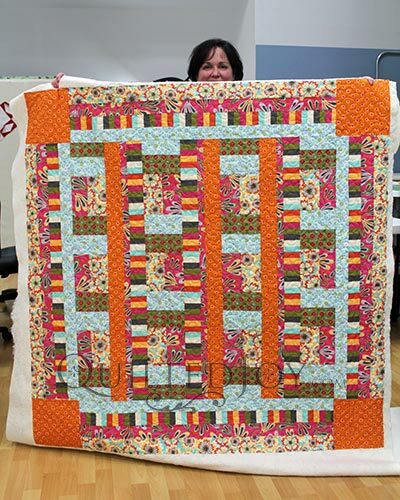 She finished this quilt with our Toss Up pantograph. It’s a three petaled flower with lots of swirls. It is, therefore, playful and sweet and fits the feel of the quilt top. I’m not sure what to call Danielle’s quilt. Besides just blocks, she used an eye catching striped fabric. The orange cornerstones with four equal sized border is a nice effect. She used this top for her rental certification class. To quilt it, she used one of our design boards called Crepe Myrtle. It’s a fun design with simple flowers mixed with a feather. Because of the feather I feel it is a great design that adds a touch of elegance. For a first time quilter, she did an excellent job. This Sunny Skies Quilt is a quilt from Margie. It is a sixteen patch alternating with a single chevron block. The way she arranged the chevron block to create an overall design is spectacular. Because of the chevron blocks, those sixteen patch blocks just seem to float above the background. What a great scrappy quilt idea! I love the frame of bright blue as well. She completed this with our meander design board. An all over meander is a great way to finish a quilt. The top is definitely the star of this show, so the meander just supports it instead of fighting it. We love our renters! We get to see so many beautiful quilts come through our doors, each unique and beautiful in their own way. It’s always exciting to see what will come in next. Next post: Who’s Ready for Linda Hrcka’s Machine Quilting Workshops?